The commencement of initial reclamation works was announced on 1 August 2016. This is the 9th Construction Phase Monthly EM&A Report for the Project which summarizes the monitoring results and audit findings of the EM&A programme during the reporting period from 1 September 2016 to 30 September 2016. The key activities of the Project carried out in the reporting month were related to Contract P560(R) Aviation Fuel Pipeline Diversion Works (Contract P560(R)) which involved pilot hole drilling using Horizontal Directional Drilling (HDD) method at launching site, stockpiling of excavated materials from HDD operation at stockpiling area, site preparation works and construction of containment pit at Sheung Sha Chau. CLP cable diversion enabling work contract involved site preparation works at the western part of the airport. The four DCM contracts involved site survey and investigation works. No marine construction works was carried out during the reporting period. The monthly EM&A programme was undertaken in accordance with the Updated EM&A Manual of the Project. During the reporting period, the ET conducted thirty-three sets of air quality measurements, twenty sets of construction noise measurements, thirteen events of water quality measurements, one ecological monitoring on Sheung Sha Chau Island, two complete sets of small vessel line-transect surveys and five days of land-based theodolite tracking survey effort for Chinese White Dolphin (CWD) monitoring as well as environmental site inspections, landscape & visual and waste monitoring. 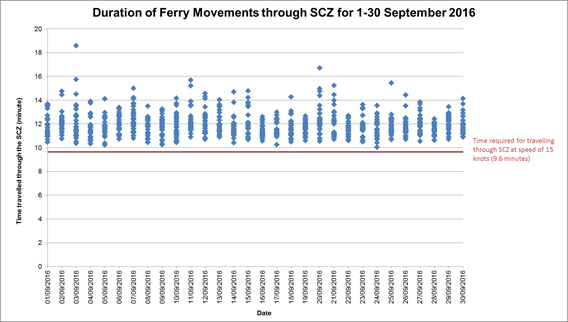 On the implementation of the SkyPier Plan, the daily movements of all SkyPier High Speed Ferries (HSFs) in September 2016 were 87 to 95 daily movements, which are within the maximum daily cap of 125 daily movements. A total of 814 HSF movements under SkyPier Plan were recorded. All HSFs had travelled through the SCZ with prevailing speed under 15 knots (7.8 to 14.4 knots) in compliance with the SkyPier Plan. One ferry movement had minor deviation from the diverted route which is related to safety / emergency situation. In summary, the ET and IEC have audited the HSF movements against the SkyPier Plan and conducted follow up investigation or actions accordingly. On the implementation of the Marine Travel Routes and Management Plan for Construction and Associated Vessel (MTRMP-CAV), ET has conducted weekly audit of relevant information, including AIS data, vessel tracks and other relevant records to ensure the Contractors are fully compliance with the requirements of the MTRMP-CAV. Trainings have been held with the Contractor senior management staff and concerned skippers to facilitating them in familiarise with the requirements of the MTRMP-CAV and strengthen the communication between senior management staff and the sub-contractors. All 1-hour total suspended particulate (TSP) monitoring was conducted as scheduled in the reporting period. Three exceedance cases of action level were recorded on 27 September 2016. The investigation results indicated that the exceedances were likely related to the background air quality level but not project-related. All construction noise and waste monitoring were conducted as scheduled in the reporting period. No exceedance of the Action/ Limit Levels was recorded. Monthly ecological monitoring on Sheung Sha Chau Island observed that site preparation work was conducted at Sheung Sha Chau and there was no encroachment or disturbance to the egretry area at Sheung Sha Chau by the works. Water quality monitoring and CWD monitoirng were conducted as scheduled although no marine construction works was carried out during the reporting period. ● Construction of containment pit at Sheung Sha Chau. ● Removal of existing armour rocks. Other site investigation works will continue. The key environmental issues will be associated with dust, noise generation, water quality, construction waste management, CWD and ecology on Sheung Sha Chau. The implementation of required mitigation measures by the Contractor will be monitored by the ET. The commencement of initial reclamation works was announced on 1 August 2016. The updated overall phasing programme of all construction works was presented in Appendix A of the Construction Phase Monthly EM&A Report No. 7 and the contract information was presented in Appendix A of the Construction Phase Monthly EM&A Report No.8. This is the 9th Construction Phase Monthly EM&A Report for the Project which summarizes the key findings of the EM&A programme during the reporting period from 1 to 30 September 2016. The Project’s organization structure remained unchanged during the reporting month. The Project’s organization structure can be referred to Appendix B of the Construction Phase Monthly EM&A Report No.1. Contact details of the key personnel have been updated and is presented in Table 1.1. During the reporting period, no marine construction work was carried out. Key activities of the Project were related to the Contract P560(R) Aviation Fuel Pipeline Diversion Works (Contract P560(R)) which involved pilot hole drilling at the HDD launching site located at the west part of the airport, site preparation works and construction of containment pit at Sheung Sha Chau. CLP cable diversion enabling work contract involved site preparation works. The four DCM contracts involved site survey and investigation works. The active construction site is around 3 km and 900m away from the nearest air and noise sensitive receivers in Tung Chung and the villages in North Lantau. The locations of the works areas are presented in Figure 1.1 to Figure 1.2. Some site investigation works were carried out during the reporting period. The status for all environmental aspects is presented Table 1.2. The EM&A requirements remained unchanged during the reporting period and details can be referred to Table 1.2 of the Construction Phase Monthly EM&A Report No. 1. The baseline air quality monitoring result has been reported in Baseline Monitoring Report (Version 1) and submitted to EPD under EP Condition 3.4. The baseline noise monitoring result has been reported in Baseline Monitoring Report (Version 1) and submitted to EPD under EP Condition 3.4. The baseline water quality monitoring result has been reported in Water Quality Baseline Monitoring Report and submitted to EPD under EP Condition 3.4. The general water quality monitoring is on-going, although there were no marine construction works. The early regular DCM water quality monitoring is on-going, although there were no marine construction works. The revised Egretry Survey Plan was submitted and approved by EPD under EP Condition 2.14. Monitoring of CWDs is on-going, although there were no marine construction works. The baseline landscape & visual monitoring result has been reported in Baseline Monitoring Report (Version 1) and submitted to EPD under EP Condition 3.4. Taking into account the construction works in this reporting month, impact monitoring of air quality, noise, waste management, ecology and landscape & visual were carried out in the reporting month. Water quality monitoring and CWD monitoring were conducted as scheduled although there were no marine construction works during the reporting period. The EM&A programme also involved weekly site inspections and related auditings conducted by the ET for checking the implementation of the required environmental mitigation measures recommended in the approved EIA Report. Air quality monitoring was conducted at two representative monitoring stations in the vicinity of air sensitive receivers in Tung Chung and villages in North Lantau in accordance with the Updated EM&A Manual. Table 2.1 describes the details of the monitoring stations. Figure 2.1 shows the locations of the monitoring stations. The portable direct reading dust meter is calibrated every year against high volume sampler (HVS) to check the validity and accuracy of the results measured by direct reading method. The calibration certificates of the portable direct reading dust meter and calibration record of the HVS provided in Appendix B of the Construction Phase Monthly EM&A Report No.8 are still valid. Any updates of calibration certificates will be reported in the Monthly EM&A report if necessary. Three exceedance cases of action level of air quality monitoring were recorded at AR1A on 27 September 2016 in the 1-hour TSP monitoring that started at 08:52am, 09:52am and 10:52am. Actions were taken accordingly based on the established Event and Action Plan as presented in the Updated EM&A Manual. IEC and AAHK were informed of the exceedances. According to on-site observation by monitoring team, haze weather was observed during monitoring. No major construction dust emission source was observed during monitoring. Based on the information from Hong Kong Observatory, tropical cyclone Megi was approaching Taiwan, its subsidence airstream create unfavourable conditions for the dispersion of pollutants and lead to low visibility to Hong Kong. According to EPD’s pollutant concentration summary at Tung Chung from 08:00 to 12:00 on 27 September 2016, relatively high PM10 ranging from 104 -159 µg/m3 was recorded. Relevant contractors were informed of the exceedances. As informed by the contractors, no major dusty activities were conducted during monitoring. The major land works were related to P560(R) HDD pilot hole drill, stockpiling of excavated materials and site preparation works at Sha Chau. The exceedances of 1-hr TSP may possibly due to the air quality impact induced by tropical cyclone Megi. Considered that no major project-related dusty construction work was conducted during monitoring, the exceedance was considered not due to 3RS project construction works and therefore, no repeat measurement is requirement. Noise monitoring was conducted at five representative monitoring stations in the vicinity of noise sensitive receivers in Tung Chung and villages in North Lantau in accordance with the Updated EM&A Manual. Figure 2.1 shows the locations of the monitoring stations and these are described in Table 3.1 below. As described in Section 4.3.3 of the Updated EM&A Manual, monitoring at NM2 will commence when the future residential buildings in Tung Chung West Development become occupied. Calibration certificates of the sound level meters and acoustic calibrators used in the noise monitoring provided in Appendix B of the Construction Phase Monthly EM&A Report No.8 are still valid. The sound level meter calibrated in September 2016 is provided in Appendix B. As the construction activities were far away from the monitoring stations, major sources of noise dominating the monitoring stations observed during the construction noise impact monitoring were aircraft noise at NM3A and NM5, aircraft noise and helicopter noise at NM6, road traffic noise at NM1A and school activities at NM4 in this reporting month. Water quality monitoring was conducted at a total of 22 water quality monitoring stations, comprising 12 impact stations, seven sensitive receiver stations and three control stations in the vicinity of water quality sensitive receivers around the airport island in accordance with the Updated EM&A Manual. Table 4.1 describes the details of the monitoring stations. Figure 3.1 shows the locations of the monitoring stations. during impact monitoring is subject to finalisation after the HKBCF seawater is commissioned. (2) According to the Baseline Water Quality Monitoring Report, Chromium and Nickel are the representative heavy metals for early regular DCM monitoring. DCM specific water quality monitoring parameters (total alkalinity and heavy metals) were only conducted at C1 to C3, IM1 to IM12. In accordance with the Updated EM&A Manual, baseline water quality levels at the abovementioned representative water quality monitoring stations were established as presented in the Baseline Water Quality Monitoring Report. General and early regular DCM water quality monitoring was conducted three days per week, at mid-flood and mid-ebb tides, at the 22 water quality monitoring stations during the reporting period, although there were no marine construction works. The sea condition varied from clam to rough, and the weather varied from fine to rainy during the monitoring period. The water quality monitoring schedule for the reporting period is provided in Appendix C.
The Action and Limit Levels levels for general water quality monitoring and regular DCM monitoring are presented in Table 4.2. The control and impact stations during flood tide and ebb tide for general water quality monitoring and regular DCM monitoring are presented in Table 4.3. 1. For DO measurement, non-compliance occurs when monitoring result is lower than the limits. 2. For parameters other than DO, non-compliance of water quality results when monitoring results is higher than the limits. 3. Depth-averaged results are used unless specified otherwise. 5. The action and limit levels for the two representative heavy metals chosen will be the same as that for the intensive DCM monitoring. ^1 As per findings of Baseline Water Quality Report, the control reference has been changed from C3 to SR2 from 1 Sep 2016 onwards. Table 4.4 summarises the equipment used in the impact water quality monitoring programme. Water quality monitoring samples were taken at three depths (at 1m below surface, at mid-depth, and at 1m above bottom) for locations with water depth >6m. For locations with water depth between 3m and 6m, water samples were taken at two depths (surface and bottom). For locations with water depth <3m, only the surface depth was taken. Duplicate water samples were taken and analysed. The water samples for all monitoring parameters were collected, stored, preserved and analysis according to the Standard Methods, APHA 22nd ed. and/or other methods as agreed by the EPD. In-situ measurements at monitoring locations including temperature, pH, DO, turbidity, salinity and water depth were collected by equipment listed in Table 4.4. Water samples for heavy metals and SS analysis were stored in high density polythene bottles with no preservative added, packed in ice (cooled to 4 ºC without being frozen), delivered to the laboratory within 24 hours of collection. Wet bulb calibration for a DO meter was carried out before commencement of monitoring and after completion of all measurements each day. Calibration was not conducted at each monitoring location as daily calibration is adequate for the type of DO meter employed. A zero check in distilled water was performed with the turbidity probe at least once per monitoring day. The probe should then be calibrated with a solution of known NTU. In addition, the turbidity probe was calibrated at least twice per month to establish the relationship between turbidity readings (in NTU) and levels of suspended solids (in mg/L). Accuracy check of the digital titrator was performed at least once per monitoring day. Calibration certificates of the monitoring equipment used in the monitoring provided in Appendix B of the Construction Phase Monthly EM&A Report No.8 are still valid. Any updates of calibration certificates will be reported in the Monthly EM&A report if necessary. Analysis of SS and heavy metals have been carried out by a HOKLAS accredited laboratory, ALS Technichem (HK) Pty Ltd (Reg. No. HOKLAS 066). Sufficient water samples were collected at all the monitoring stations for carrying out the laboratory SS and heavy metals determination. The SS and heavy metals determination works were started within 24 hours after collection of the water samples. The analysis of SS and heavy metals have followed the standard methods summarised in Table 4.5. The QA/QC procedures for laboratory measurement/ analysis of SS and heavy metals was presented in Appendix F of the Construction Phase Monthly EM&A Report No.8. No marine construction works was conducted during the reporting period and hence no adverse water quality impact arised from the project was observed. The general water quality monitoring was completed as scheduled. Water quality monitoring results and graphical presentations are provided in Appendix D.
In accordance with the Updated EM&A Manual, the waste generated from construction activities was audited once per week to determine if wastes are being managed in accordance with the Waste Management Plan (WMP) prepared for the Project, contract-specific WMP, and any statutory and contractual requirements. All aspects of waste management including waste generation, storage, transportation and disposal were assessed during the audits. The Action and Limit levels of the construction waste are provided in Table 5.1. Recommendation was provided for P560(R) Aviation Fuel Pipeline Diversion Works during monitoring including review of the capacity of chemical waste storage area on 26 September 2016. The contractor had followed up with implementation of mitigation measures. Based on the updated information, about 127m3 excavated materials were produced from the HDD launching site under P560(R) in September 2016. The generated excavated materials were temporarily stored at storage and stockpiling area. The excavated material will be reused in the Project. In addition, metals and paper were recycled during the reporting month. 4.2 tonnes of general refuse were disposed of to the West New Territories (WENT) Landfill in September 2016. No Construction and Demolition (C&D) material was disposed off-site during the reporting month. No waste was generated from other contracts during the reporting period. No exceedances of the Action and Limit Levels were recorded in the reporting period. In accordance with the Updated EM&A Manual, CWD monitoring by small vessel line-transect survey supplemented by land-based theodolite tracking should be conducted during construction phase. The monitoring was completed in the reporting period, although there were no marine construction works. The small vessel line-transect survey as proposed in the Updated EM&A Manual should be conducted at a frequency of two full survey per month while land-based theodolite tracking should be conducted at a frequency of one day per month per station during the construction phase. In addition to the land-based theodolite tracking required for impact monitoring as stipulated in the EM&A Manual, some supplemental theodolite tracking have also been conducted during the initial implementation period for the SkyPier HSF diversion and speed control in order to assist in monitoring the effectiveness of these measures, i.e. in total twice per month at the Sha Chau station and three times per month at the Lung Kwu Chau station. The Action Level (AL) and Limit Level (LL) for CWD monitoring were formulated by the action response approach using the running quarterly dolphin encounter rates STG and ANI derived from baseline monitoring data, as presented in the CWD Baseline Monitoring Report. The derived values of AL and LL for CWD monitoring were summarized in Table 6.1. ^Limit Level – two consecutive running quarters mean since works commenced on 1 August 2016, the first running quarter for reporting will be 18 May to 17 June 2016, July 2016 to August 2016, and the second running quarter will be July 2016 to September 2016. Small vessel line-transect surveys were conduct along the transects covering Northeast Lantau (NEL), Northwest Lantau (NWL), Airport West (AW), West Lantau (WL) and Southwest Lantau (SWL), as proposed in the Updated EM&A Manual and being consistent with the AFCD long-term monitoring programme (except AW). The AW transect has not been previously surveyed in the AFCD programme due to the restrictions of HKIA Exclusion Zone, nevertheless, this transect was established during the EIA of the 3RS project with the aim to collect project specific baseline information within the HKIA Approach Area to fill the data gap that was not covered by the AFCD programme. This provided a larger sample size for estimating the densities and patterns of movements in the broader study area of the project. For the NWL area, there was no physical demarcation of the 3RS works area yet during CWD monitoring survey in the reporting period, therefore the works area of the 3RS project was still accessible and the transect lines followed the waypoints and lengths conducted for baseline monitoring. These transect lines were depicted in Figure 6.1 while the coordinates of all transect lines are shown in Table 6.2. Land-based theodolite tracking stations were set up at two locations, one facing east/south/west on the southern slopes of Sha Chau (SC), and the other facing north/northeast/northwest at Lung Kwu Chau. The stations (D and E) are depicted in Figure 6.2 and shown in Table 6.3 with position coordinates, height of station and approximate distance of consistent theodolite tracking capabilities for CWD. 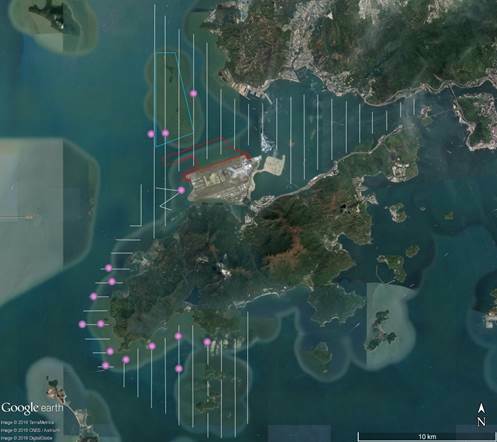 The surveys involved small vessel line-transect data collection and have been designed to be similar to, and consistent with, previous surveys for the Agriculture, Fisheries and Conservation Department (AFCD) for their long-term monitoring of small cetaceans in Hong Kong. The survey was designed to provide systematic, quantitative measurements of density, abundance and habitat use. All on-effort data collected under conditions of Beaufort 0-3 and visibility of approximately 1200 m or beyond, on both primary and secondary transect lines, were used for analysis. When CWDs were seen, the survey team was taken off-effort, the dolphins were approached and photographed for photo-ID information (using a Canon 7D [or similar] camera and long 300 mm+ telephoto lens), then followed until they left the study area or were lost. At that point, the boat returned (off effort) to the next survey line and began to survey on effort again. Chinese White Dolphins can be identified by their unique features like presence of scratches, nick marks, cuts, wounds, deformities of their dorsal fin and distinguished colouration and spotting patterns. Land-based monitoring obtains fine-scale information on the time of day and movement patterns of the CWDs. A digital theodolite (Sokkia/Sokkisha Model DT5 or similar equipment) with 30-power magnification and 5-s precision was used to obtain the vertical and horizontal angle of each dolphin and vessel position. Angles were converted to geographic coordinates (latitude and longitude) and data were recorded using Pythagoras software, Version 1.2. This method delivers precise positions of multiple spatially distant targets in a short amount of time. The technique is fully non-invasive, and allows for time and cost-effective descriptions of dolphin habitat use patterns at all times of daylight. Three surveyors (one theodolite operator, one computer operator, and one observer) were involved in each survey. Observers searched for dolphins using unaided eyes and handheld binoculars (7X50). Theodolite tracking sessions were initiated whenever an individual CWD or group of CWDs was located. Where possible, a distinguishable individual was selected, based on colouration, within the group. The focal individual was then continuously tracked via the theodolite, with a position recorded each time the dolphin surfaced. In case an individual could not be positively distinguished from other members, the group was tracked by recording positions based on a central point within the group whenever the CWD surfaced. Tracking continued until animals were lost from view, moved beyond the range of reliable visibility (>1-3 km, depending on station height), or environmental conditions obstructed visibility (e.g., intense haze, Beaufort sea state >4, or sunset), at which time the research effort was terminated. In addition to the tracking of CWD, all vessels that moved within 2-3 km of the station were tracked, with effort made to obtain at least two positions for each vessel. Within the monitoring month of September 2016, two complete sets of small vessel line-transect surveys were conducted on the 5th, 6th, 8th, 19th, 20th, 22nd, 26th and 27th September 2016, covering all transects in NEL, NWL, AW, WL and SWL survey area for twice. A total of 470.09 km of survey effort was collected from these surveys, with around 97.3% of the total survey effort being conducted under favourable weather condition (i.e. Beaufort Sea State 3 or below with favourable visibility). Details of the survey effort may refer to Appendix D.
In September 2016, 18 groups of CWD with 73 individuals were sighted. Amongst the sightings of CWD, 16 groups with 67 individuals were made during on-effort search under favourable weather condition (i.e. Beaufort Sea State 3 or below with favourable visibility). Details of cetacean sightings are presented in Appendix D.
Distribution of CWD sightings recorded in September 2016 is illustrated in Figure 6.3. The sightings were mainly located east and southwest off Sha Chau and Lung Kwu Chau Marine Park (SCLKCMP) in NWL, near Tai O, Peaked Hill and Fan Tau in WL and along the coast from Fan Lau to Lo Kei Wan in SWL. One sighting was recorded in AW near to the existing Hong Kong International Airport, whilst no sightings of CWDs were recorded within the 3RS land-formation footprint. Note: Only on-effort sightings under Beaufort 3 or below were presented in the figure. The STG and ANI of CWD in the whole survey area (i.e. NEL, NWL, AW, WL and SWL) of September 2016 and the running quarterly STG and ANI calculated from the three preceding survey months are presented in Table 6.4 below. *Running quarterly encounter rates STG & ANI for reporting were calculated from the three preceding survey months, i.e. the data in July 2016, August 2016 and September 2016 containing six sets of transect surveys for all monitoring areas. In September 2016, the average group size of CWDs was 4.2 individuals per group. The number of CWD sightings with small group size (i.e. 1-2 individuals) and that with medium group size (3-9 individuals) were similar. One large CWD groups with 10 individuals was sighted in WL. A group of four CWDs was sighted in association with operating purse seiner near Tai O in September 2016. No mother-calf pairs were sighted in September 2016. In September 2016, a total number of 37 different CWD individuals were identified. Amongst these 37 identified individuals, eight (NLMM005, NLMM010, WLMM007, WLMM025, WLMM027, WLMM054, SLMM022 and SLMM030) were sighted twice and one (SLMM002) was sighted three times in September. A summary of photo identification works is presented in Table 6.5. Representative photos of these individuals may refer to Appendix D.
Land-based theodolite tracking surveys at Lung Kwu Chau were conducted on 1st , 7th and 26th September 2016 and at Sha Chau on 13th and 23rd September 2016, with a total of 5 days of land-based theodolite tracking survey effort have been accomplished in September 2016. In total, nine CWD groups were tracked during the surveys. Information of survey effort and CWD groups sighted during these land-based theodolite tracking surveys are presented in Table 6.6. Details of the survey effort and CWD groups tracked are presented in Appendix D. The first sighting locations of CWD groups tracked at LKC station during land-based theodolite tracking surveys in September 2016 were depicted in Figure 6.4. No CWD group was sighted from SC station in this reporting month. Underwater acoustic monitoring using Passive Acoustic Monitoring (PAM) should also be undertaken within the whole duration for land formation related construction works. An Ecological Acoustic Recorder (EAR) has been deployed and positioned at south of Sha Chau Island with 20% duty cycle (Figure 6.5). The EAR deployment is generally last for 4-6 weeks prior to data retrieval as one batch of data collection for analysis. Acoustic data will be gathered to listen for CWDs occurrence patterns and to obtain anthropogenic noise information simultaneously. Analysis (by a specialized team of acousticians) involved manually browsing through every acoustic recording and logging the occurrence of dolphin signals. All data will be re-played by computer and listened to by human ears for accurate assessment of dolphin group presence. As the period of data collection and analysis takes more than two months, PAM results could not be reported in monthly intervals. No marine construction works was carried out during the reporting period. Audits of acoustic decoupling for construction vessels were carried out. Marine mammal watching and dolphin exclusion zone implementation were not applicable during this reporting period. Audits of SkyPier High Speed Ferries route diversion and speed control and construction vessel management are presented in Section 7.2 and Section 7.3 respectively. For indication, detailed analysis of CWD monitoring results collected by small vessel line-transect survey will be provided in future quarterly reports. Detailed analysis of CWD monitoring results collected by land-based theodolite tracking and PAM will be provided in future yearly reports when a larger sample size of data has been collected. CWD monitoring was conducted as scheduled. As no marine construction works was carried out during the reporting period, no adverse impact arised from the project was observed. Weekly site inspection of the construction works for P560(R) and CLP cable diversion enabling works were carried out by the ET to monitor the implementation of proper environmental pollution control and mitigation measures for the Project. The weekly site inspection schedule of the construction works is provided in Appendix C. Bi-weekly site inspections were also conducted by the Project’s Independent Environmental Checker (IEC). Observations have been recorded in the site inspection checklists and passed to the Contractor together with the appropriate recommended mitigation measures where necessary. The key observations from site inspection and associated recommendations were related to the review of the capacity of chemical waste storage area, better maintenance of drip tray for chemical containers, display of Environmental Permit at site entrance, erection of site hoarding, provision of sandbags around the gully to prevent surface runoff and improvement of dust mitigation measures. Key audit findings for the SkyPier HSFs travelling to/from Zhuhai and Macau against the requirements of the SkyPier Plan during the reporting period are summarized in Table 7.1. The daily movements of all SkyPier HSFs in September 2016 were within the maximum daily cap number (i.e. 87 to 95 daily movements, which are within maximum daily cap of 125 daily movements). Status of compliance with annual daily average of 99 movements will be further reviewed in the annual EM&A Report. In total, 814 ferry movements between HKIA SkyPier and Zhuhai / Macau were recorded in September 2016 and the data are presented in Appendix G. The time spent for the SkyPier HSFs travelled through the SCZ in September were presented in Figure 7‑1. It will take 9.6 minutes to travel through the SCZ when the SkyPier HSFs adopt the maximum allowed speed of 15-knot within the SCZ. Figure 7‑1 shows that all the SkyPier HSFs spent more than 9.6 minutes to travel through the SCZ. ● Case on 5 September 2016: HSF captain reported that he had to give way to other vessels for safety reason which causes the minor route deviation. Then the HSF returned to the normal route following the SkyPier Plan. Cases of minor route deviation on 14, 26 and 28 August 2016 have been followed up. 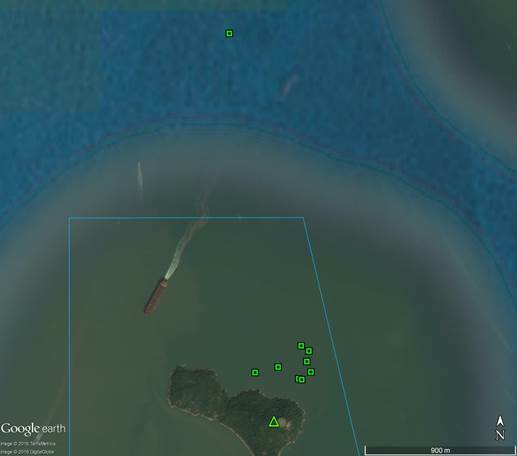 For the case on 14 August 2016, the Ferry Operator reported that it was the first time the concerned HSF travelled through the diverted route, and they discovered some inaccuracy of the plot of Speed Control Zone in the radar graph. After that, they have checked and corrected the coordinates of Speed Control Zone in both the radar graph and electronic marine chart. For the cases on 26 and 28 August 2016, investigation found that the vessel captain was required to give way to other vessels for safety reason, which causes the minor route deviation within the Speed Control Zone. After that, the HSF returned to the normal route following the SkyPier Plan. The prevailing speed (the average speed taken within the SCZ) of all HSFs were within 15 knots (7.8 knots to 14.4knots), which complied with the SkyPier Plan. The time used by HSF to travel through SCZ is presented in Figure 7‑1. The Marine Travel Routes and Management Plan for Construction and Associated Vessel (MTRMP-CAV) has been submitted and approved in December 2015 by EPD under EP Condition 2.9. The approved Plan is available on the dedicated website of the Project. · 7 skipper trainings have been held with 4 DCM and P560(R) contractors’ concerned skippers of construction vessels associated with construction works to familiarise them with the predefined routes, general education on local cetaceans, guidelines for avoiding adverse water quality impact, the required environmental practices / measures while operating construction and associated vessels under the Project, and guidelines for operating vessels safely in the presence of CWDs. · Trainings have also been held with the 4 DCM and P560(R) contractor senior management staff to strengthen the commiunication between senior management and the sub-contractor and facilitating them in familiarise with the requirements of the MTRMP-CAV. · A Marine Management Liaison Group (MMLG) has been set up and provided a forum to assist and resolve any marine issues which may be encountered under 3RS project. ET has participated in the 2nd MMLG meeting which was held on 26 September 2016. The ET worked with the new contractors in mobilising for the 3RS works on reviewing and facilitating them in familiarise with the requirements of the MTRMP-CAV. In September, ET has conducted weekly audit of relevant information, including AIS data, vessel tracks and other relevant records to ensure sufficient information has been provided by the contractors to the Marine Traffic Control Center (MTCC) and the contractors are fully complied with the requirements of the MTRMP-CAV. The contactors have been reminded to submit the endorsed vessel 3-month programme to MTCC for the review of keeping the number of construction vessels to a practicable minimum. The IEC of the Project has also performed audit on the compliance of the requirements as part of the EM&A programme. In accordance with the Updated EM&A Manual, ecological monitoring shall be undertaken monthly at the HDD daylighting location on Sheung Sha Chau Island to identify and evaluate any impacts with appropriate actions taken as required to address and minimise any adverse impact found. Monthly ecological monitoring on Sheung Sha Chau Island observed that site preparation work was conducted at Sheung Sha Chau and there was no encroachment or disturbance to the egretry area at Sheung Sha Chau by the works. ● Laying of geotextile and sand blanket. ● Acoustic decoupling measures for equipment on marine vessel. The implementation of required mitigation measures by the Contractor will be monitored by the ET. Key activities of the Project carried out in the reporting month were related to Contract P560(R) which involved drilling of HDD pilot hole at launching site, stockpiling of excavated materials from HDD operation at stockpiling area, site preparation works and construction of containment pit at Sheung Sha Chau. Works under the four DCM contracts involved site survey and investigation works, and CLP cable diversion enabling work involved site preparation works. Some other site investigation works were also carried out during the reporting period. Construction dust, noise, waste and ecological monitoring were carried out in the reporting period. The water quality monitoring and CWD monitoring were completed as scheduled although no marine construction works was carried out during the reporting period. Three exceedance cases involving Action Level of 1-hour TSP monitoring were recorded during the reporting period. The investigation results indicated that the exceedances were likely related to background air quality level but not project-related. No breach of the Action or Limit Levels in relation to the construction noise, waste, ecological monitoring were recorded in the reporting month. All site observations made by the ET were recorded in the site inspection checklists and passed to the Contractor together with the recommended follow-up actions. On the implementation of the Marine Travel Routes and Management Plan for Construction and Associated Vessel (MTRMP-CAV), ET has conducted weekly audit of relevant information, including AIS data, vessel tracks and other relevant records to ensure full compliance with the requirements of the MTRMP-CAV. Trainings have been held with the Contractor senior management staff and concerned skippers to facilitating them in familiarise with the requirements of the MTRMP-CAV and strengthen the communication between senior management staff and the sub-contractors. The ET is also working with contractors to familiarise with the requirements of the MTRMP-CAV.